A couple of months ago when we were in Minneapolis for a wedding, we stopped by the Mall of America (I didn't know what to expect, but I cannot imagine how any other malls in the area manage to stay in business). 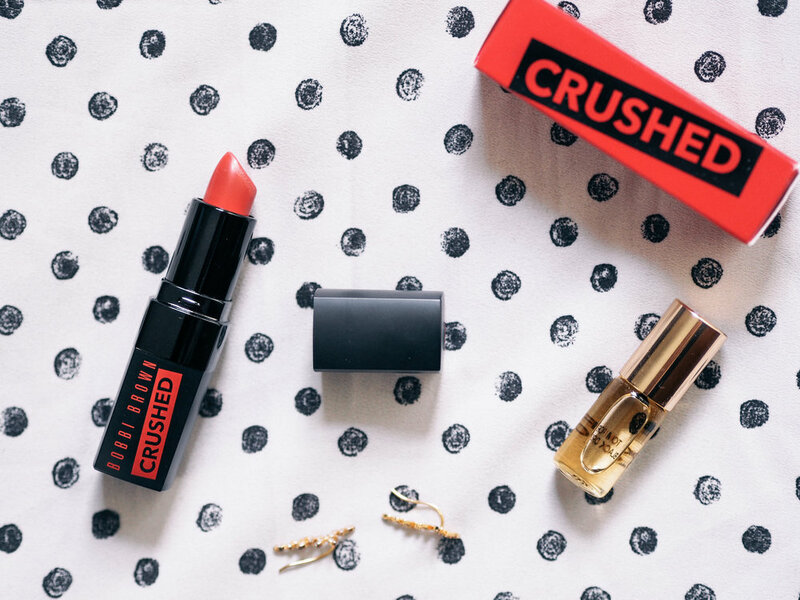 I was on the hunt for the perfect coral lipstick. I had a few formulations in mind from new releases I'd been seeing, but once I swatched them on my hands, I realized the majority of them were either too orange or too pink. I made my way down the aisles, swatching coral lipstick after coral lipstick until I ran across Bobbi Brown's Crushed Lipstick in Molly Wow. Created by Molly Chiang, the color is that perfect balance between orange and red. The formula claims to be a mix between a balm and a lipstick, and I'd 100% agree with that. It's a very pigmented formula that glides on really easily and doesn't dry my lips out. It lasts quite a few hours for such a balmy formula and almost stains my lips (in the best way). Right now, the exact shade is backordered on all sites, but there are other beautiful shades available on Sephora. If you're looking to try a new lipstick with a stunning formula, treat yourself to one of these Crushed lipsticks from Bobbi Brown.